Last month marked the London Underground’s 150th year anniversary! That’s a lot of years of impatient commuters shuttling from station to station trying to get on with their daily lives. The Tube has saved Londoners countless hours of precious time that would have been wasted stuck in traffic on a London bus. Newbies to the Underground game are going to have a difficult time at first. It can seem like a daunting experience at first, so I’ve written a little beginner’s guide for the London Underground. Grab a cuppa to sip on and enjoy! I’m sure you’ve seen it around everywhere—even outside the capital. The London Tube Map was first designed in 1931 by engineer Harry Beck. Believe it or not, the Tube Map we see today is a simplified version, despite looking like a tangled bunch of messy wires. Unfortunately, the map isn’t to scale or very geographically accurate. It does do the job, though, and clearly illustrates all the different lines. There are eleven of them in total, each in a different color spread through London. You have two options to choose from if you’re new to the Underground: a travel card or an Oyster card. If you’re planning on staying in your London vacation rental for a while, then the Oyster card is a no-brainer. You’ll find every Londoner carrying one of these bad boys—in their wallet, card holders, bags, pockets, etc. It’s a pre-paid card that you can swipe off at any Tube station. You can get it topped up at a corner shop or Tube/Train stations. Oyster cards cost £13.00 and come with £10.00 credit—essentially costing £3.00 each. You can use your card indefinitely and the credit never expires. Oyster card journeys always end up costing less than half compared to a cash-journey. For example, a trip from Whitechapel to Brixton costs £2.10 with an Oyster card and £4.50 by cash. It’s ridiculous! If you’re only in London for a day, go for the day travel card. If you’re here for longer, then choose the Oyster card. It has a daily cap, too, meaning that it stops deducting credit once you hit £6.50. Any journey before 9:30 am on a weekday counts as peak. This journey will not only cost you more, but also means pushing and fighting your way through crowds of commuters going in every direction you can think of. After waiting for several trains before you get on one, you’ll be lucky to get enough space to breathe. Avoid peak times whenever you can. Walking is a more cost-effective and healthier alternative. The most common mistake tourists make is pay for a journey that’s walking distance. A famous one is the 260 meter trip from Leicester Sq. to Covent Garden, 45 seconds from one stop to the other. This trip costs a whopping £4.00! Always check the map before you tap in that Oyster card because you could end up saving enough for a nice meal. Smaller stations often have discreet check in/out Oyster machines. During off-peak hours, the barriers are left open and you can easily forget to tap in/out. If you get caught, you’ll be fined £6.50 at minimum. 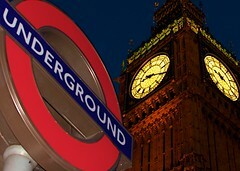 In Cockney slang, Londoners call the Tube ‘Oxo’. Don’t try to pull this off if you don’t have the accent, though! Sohaib is a travel writer who takes every chance to explore the unknown. When he isn’t travelling around Europe, you’ll find him in the capital writing for HotelClub.com who provide discount London hotel deals.